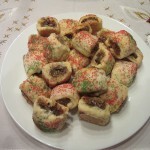 Cuccidati, AKA, the Mother of all Italian Christmas Cookies! Is there ever in this world a cookie so associated with Christmas in the Italian community as the Cuccidati? I think not. Thank goodness the Cuccidati spread their delightfulness far beyond the shores of Italia. 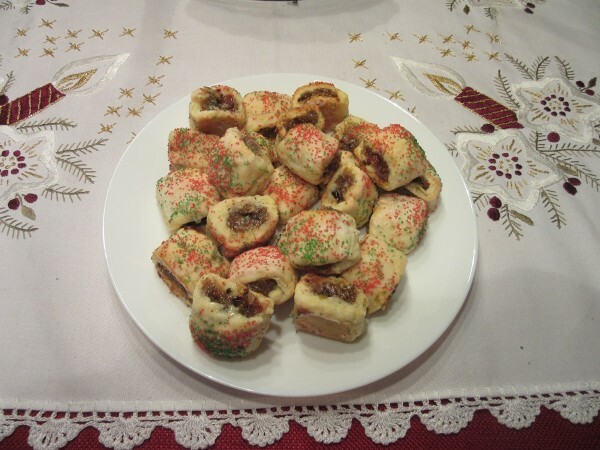 These citron flavored fig cookies with raisins and minced almonds, wrapped in a light buttery pastry are to me, one of the best parts of the holiday season. Dipped in powdered sugar icing and capped with red and green sprinkles, I have devoured these luscious little pillows for more years than I care to remember. I can only hope for many more years of figgy cookies! I was first taught how to make these 2 bite morsels by my Unit Secretary at Sisters of Charity Hospital back in, oh….1982, I think. Jo was a marvelous baker and enjoyed treating her Nurses at every holiday. I experimented over the years until I developed a recipe that was just right for me and my family. Anyone who makes these cookies has definite opinions on what should be and should not be included. Some people would never include orange. Some will add dates but not raisins. Honey? I love it. Others do not. Some cooks like cinnamon in the filling. Surely not for me! In my humble opinion this recipe is just plain perfect. But, then why do I think the Cuccidati that Sharon’s Mom makes are the best in the world? LOL! Go ahead and try these. Taste the filling as you go and you decide if it is “just right” as is, or if you need to tweak it to your liking. Enough talking. Let’s go build us some Cuccidati! Tender, buttery pastry envelopes this rich, dense, fruity fig and citron filling. Almonds add delightful texture and bite. A quick dunk in powdered sugar icing and sprinkled with red and green sugar and you got your "Ho, Ho, Ho, on!" Bake: 400 degrees for 15-18 minutes until golden. Gather all your ingredients and set them out in the order needed. Here is a hint I learned a thousand years ago. Called "clean as you go." As you use each ingredient, put it away. Then there is never any doubt if you forgot something or not. If your mind shoots off in a thousand different directions as mine does, this really helps! First we will make the cookie dough. 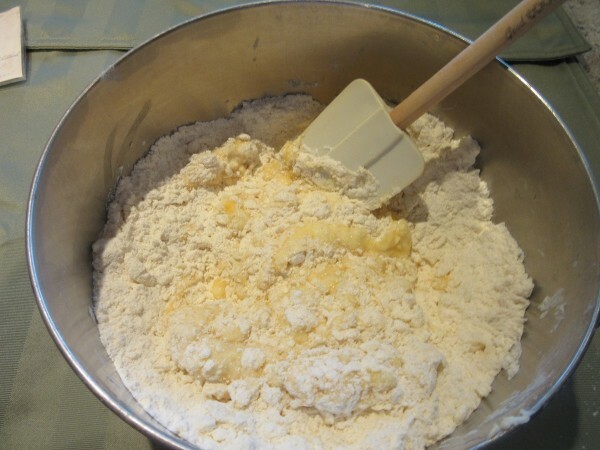 Measure the flour, baking powder and sugar into a medium size bowl. Cut in the Shortening and the Butter as you would for a pie crust using a pastry cutter or 2 forks. Gently stir in the 2 beaten eggs and then add 2 TBSP water. Combine until a soft dough forms. It should not be wet, but just moist enough to form a nice soft ball. Set the dough aside. 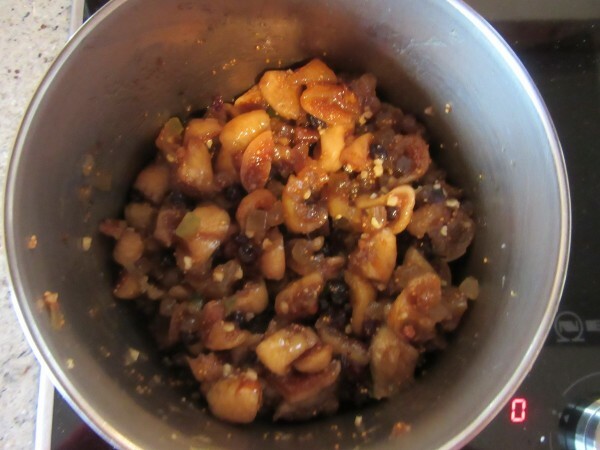 In a saucepan, combine the chopped Figs, Raisins, Citron, Almonds, Honey and Orange Juice. 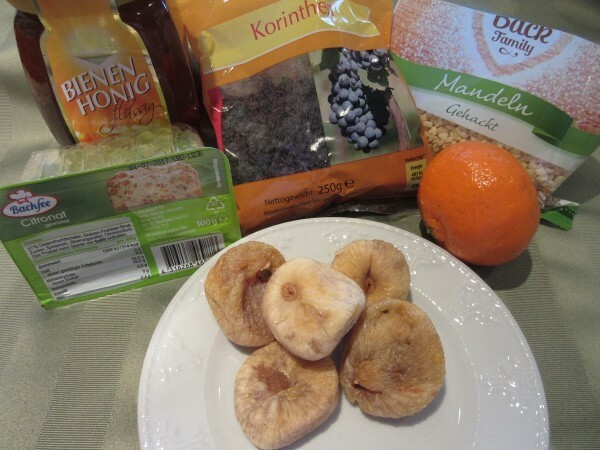 Bring to a simmer and cook for 10-15 minutes until fruit is nice and soft. Add a bit more OJ if needed to keep the fruit from sticking to the bottom of the pan. Careful! You don't want to burn this ( hmmm....and I know this because?). Let this mixture cool abut 10 minutes. Mixture will be thick, not watery! 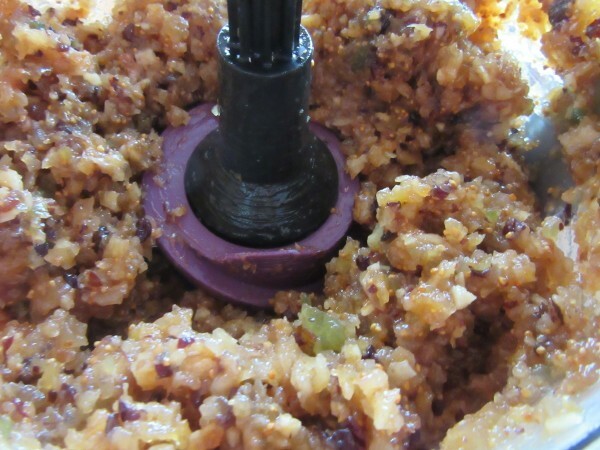 Place the filling mixture in a food processor and "Pulse" until it forms small pieces but NOT pureed. Let COOL completely! About 20 minutes in the refrigerator. 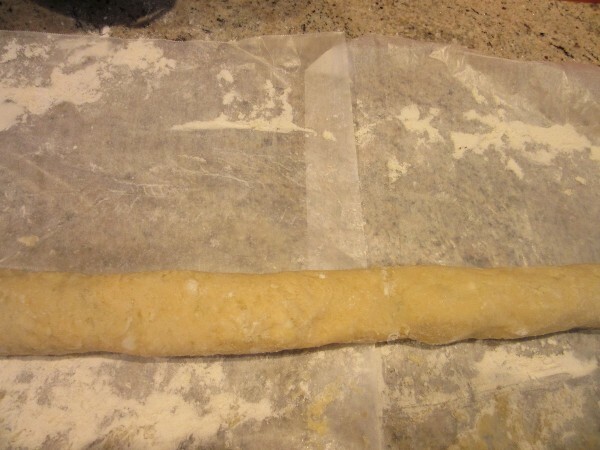 On a well floured surface, roll the dough into a 12 inch by 15 inch rectangle. * Hint: I dampen by kitchen counter top with water then lay down plastic wrap. The water holds the wrap to the counter top. Then flour the wrap and lay down your dough. Cut the dough into 4 inch by 15 inch rectangles. 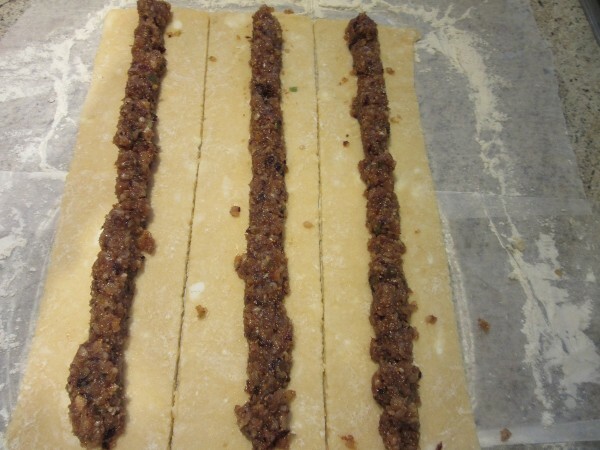 Wet your hands and gently squeeze and pat the filling down the center of each row. Carefully "eyeball" what you're doing as it is too easy to place too much filling and then you can't fold the dough over. 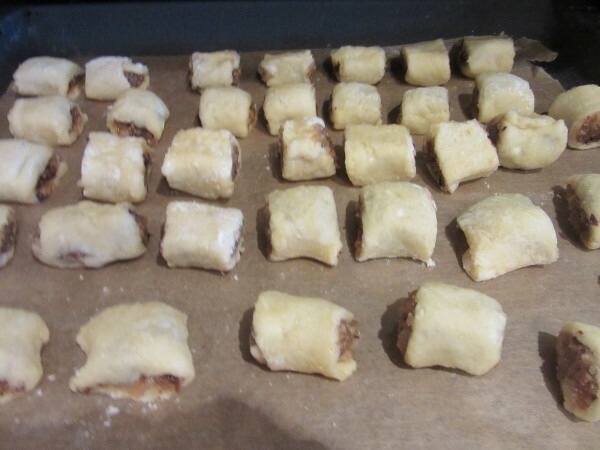 Roll each section into one mighty long cigar and pinch the edges to close in the filling. 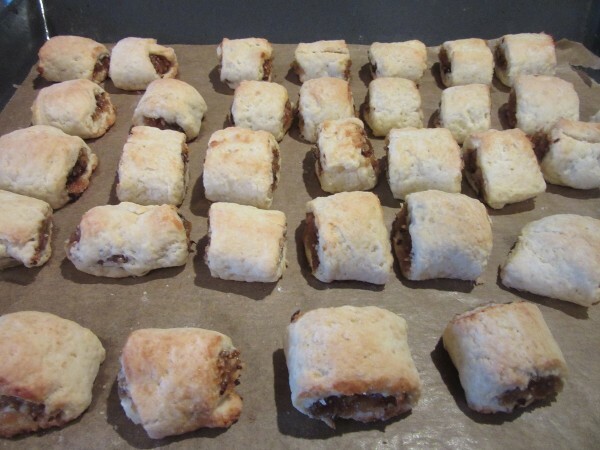 Cut each roll into 1 inch pieces and place on a parchment paper lined cookie sheet. If no paper, then grease your baking pan lightly. The cookies do not spread so you can place them close together. Bake at 400 degrees for 15 -18 minutes or until golden. Remove from the oven and cool completely on a wire rack. 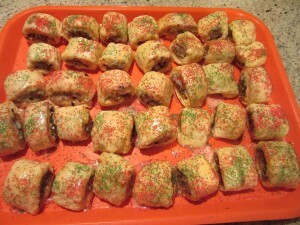 Frost by dunking each cookie in a powdered sugar icing and immediately sprinkle with red and green sugar crystals. 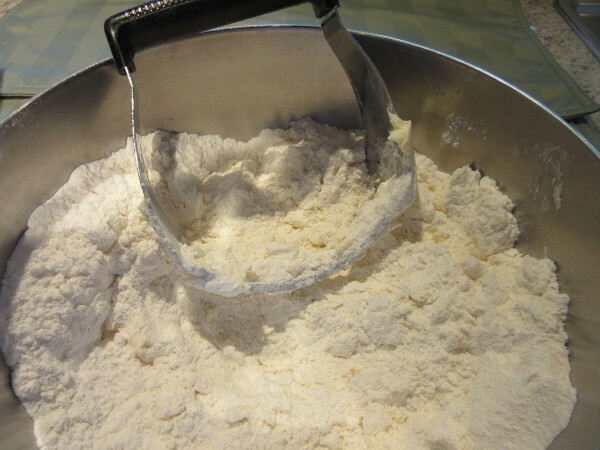 For powdered sugar icing I just use 1 Cup of SIFTED powdered sugar, a pinch of salt and 2 TBSP milk or water. Try not to eat too many as we must remember we're giving these as gifts to family and friends! I may need to make another batch! These look yummy. I did not get to make any this year but my sister Jodi did and sent a tin to me. Along with the Cucidati another favorite of mine that again my grandma Rizzo’s recipe right from Sicily are the sesame cookies (love those with coffee) and the chocolate spice balls otherwise known as Mostacioli. Mangia and enjoy my friend. I never knew the chocolate spice balls had an official name Sharon! I’ll be making Mostcioli today! I’M glad your sister sent some cookies. What’s Christmas without Cuccidati? How do you store your cuccidati? Does it make a difference if you use metal tins or plastic containers? Hi Laura, I store them in a Zippered plastic bag inside metal Christmas tins. They also freeze very well! Thank you for this! My aunt used to make them for every Christmas. It just doesn’t seem like Christmas without these cookies. I never knew their official name (she just called them Italian cookies) so now I can make them myself and bring back those memories.